VariTank - Storage in Confined Spaces | ModuTank Inc.
Modular VariTank components are designed for hand-carrying through doorways or other small openings for rapid bolt-together assembly in basements, tunnels, interior rooms and other hard-to-reach locations. VariTanks provide low-cost fluid handling for permanent or standby service indoors and outdoors. In addition, VariTanks can be quickly disassembled for relocation or storage. A typical VariTank can be installed in a day by two workers using common hand tools. No special skills are required. Little or no ground preparation is needed. They can either be installed free-standing or anchor-bolted to new or existing concrete foundations. 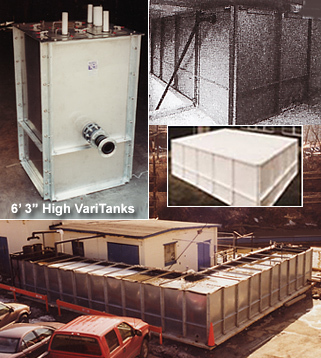 Standard Varitanks are available in sizes based on 3’6” wide by 6’3” or 8”0” high modular panels. Customized heights are also available. Virtually any shape utilizing right angles such as square, rectangle, “U”, “L”, “X”, etc. (see Custom Tanks) can be assembled from VariTank’s unique modular components. This capability is especially useful for installations with irregular shapes or with special flow requirements. Covers are fabricated from type 304 or type 316 stainless steel. Floating and tarp type covers fabricated from various liner materials are also available. Inlet and outlet pipes can be installed over the top, through the bottom or through-the-wall or cover with flange fittings in factory cut holes. Flange fittings, hatches, leak detectors, ladders, vents, baffles and adjustable standpipes are available. Liners in reinforced polypropylene, XR-5 and potable water grade polypropylene are available. Double liner leak detection with sight tube leak detectors is optionally available. For harsh environments we can fabricate the VariTank and its cover from type 304 stainless steel. Type 316 stainless is also available. Through-the-wall flanges with stainless steel or PVC wetted surfaces are also available. 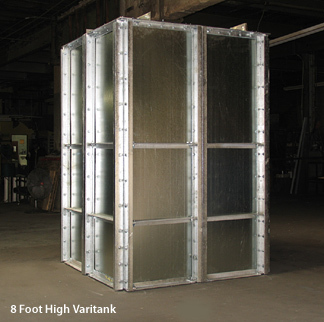 VariTank wall panels are 16 ga. G90 mill galvanized steel (stainless is optional), 3” x 2” x 1/4″ steel angle support posts and rails, 1/8” x 6” steel webs (8’ high only), and grade 5 fasteners. Factory fabricated stainless steel tension cables are included. Eight oz. geotextile liner underlayment is included.